The website also says that the Navajo Code Talkers began on May 4, 1942 when 29 Navajo Indians were sent to San Diego, California. These men would be recruits for a unique U.S. Marine Corps program. Their mission, critical to America’s armed forces during World War II, involved creating an undecipherable code without a written alphabet. The code would be further complicated with common Navajo words having substitutions confined only to memory. This communication code was critical for confounding enemy forces so that American troop plans, movements, and communications remained secure. The Navajo Code talkers program involved American Indians leaving their sacred homeland for the first time to travel overseas. Their efforts on the front line of battle contributed to the saving of countless American lives. During World War II about 400 Navajos participated in the code program. These code talkers were critical to America’s victory and vital to every U.S. Marine assault in the Pacific from 1942-1945. On Nov. 27, Peter MacDonald, president of the 13 surviving Navajo Code Talkers, was honored with two of his Code Talker colleagues at the White House. After watching his inspiring remarks expressive of his American patriotism, I took time to do some research on this great man. I came across an inspirational documentary film titled “A Journey of Perseverance” about MacDonald and the Navajo Code Talkers. The film is archived at multiple sites including the Navajo Nation Museum and the Smithsonian Institute of the American Indian. Hopefully, it will someday also be archived at a new museum in Washington, D.C. that honors the legacy of the Navajo Code Talkers. In the film, MacDonald speaks about the Navajo language as a non-written form of communication. He stated that this is what made it so successful since it could only be understood by the 400 Navajo Code Talkers in the U.S. Marine Corps. MacDonald also stated that all of the 600 code words were top secret to Code Talkers only. He illustrated how the code saved a company of Marines pinned down by the enemy on Iwo Jima. During this incident, a Navajo Code Talker from the front line communicated in code a distress call pinpointing their location and called for immediate demolition team intervention. A team of Marines was immediately dispatched, unbeknownst to the enemy due to the code, and the Marines in harm’s way were saved. “So thank you very much. 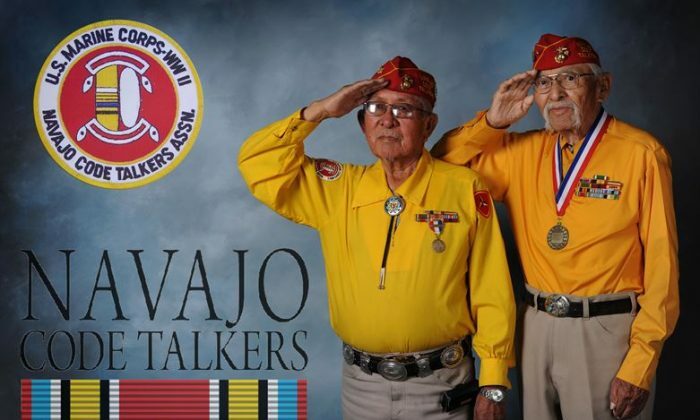 The 13 of us, we still have one mission—that mission is to build a national Navajo Code Talker Museum. We want to preserve this unique World War II history for our children, grandchildren, your children, your grandchildren to go through that museum. America is deservingly proclaimed as “the land of the free and home of the brave.” This proclamation is possible only because of patriots such as the Navajo Code Talkers who honorably served in the U.S. Marine Corps and all our armed forces. Our nation must eternally honor their sacrifices, patriotism, and valor. These patriots served as ethical protectors of America’s freedom, and their museum deserves to be built. May America be eternally grateful for Navajo Code Talkers. The Navajo Code Talkers rose to the occasion to exercise America’s sacrosanct right to protect ourselves and all people of moral decency. They deserve our admiration, respect, and a Navajo Code Talkers Museum to forever remember their sacrifices.